Thirteen to Centaurus opens on a space-station which is run by a crew of thirteen. It becomes clear quite quickly that all of them, apart from Dr Francis (Donald Houston), have had their minds conditioned. But Abel (James Hunter) is beginning to rebel and questions why they are here and what they are doing. Dr Francis takes Abel into his confidence and tells him that they are actually on a “multi-generation space vehicle” which is traveling from Earth to Alpha Centauri. Given that the ship can only travel at sub-light speed, it will take hundreds of years before the ship makes planetfall and Dr Francis explains that none of them will ever set foot on the new planet – this is a privilege reserved for future generations. The truth is rather more complicated though and once Dr Francis has encouraged Abel to think for himself, the young man is dogged in his determination to discover all of the answers. Thirteen to Centaurus was a short story by J.G. Ballard originally published in 1962. The story, and of course this episode of OOTU, has a major twist – which for those coming to it for the first time I won’t reveal. It certainly pushes the tale in a different direction and poses some interesting questions. The conditioning (or effectively brainwashing) that the ship’s crew are subjected to is an intriguing part of the story. Early on we see some of them working out in the gym and chanting “There is no other world than this. There are no other creatures but the chosen and their children shall inherit the Universe”. This is an unsettling moment (absent from Ballard’s story) which is creepily effective. As Abel’s reasoning grows, he begins to question more and more and effectively reverses the pupil/master relationship between himself and Dr Francis. Like the majority of the crew, James Hunter is somewhat wooden as Abel (we could assume this is intentional – due to the conditioning he’s been subjected to). Donald Houston as Dr Francis is pretty solid, although his performance isn’t, at times, particuarly subtle (see Moonbase 3 for more examples of Houston’s unsubtle acting choices in a sci-fi setting). 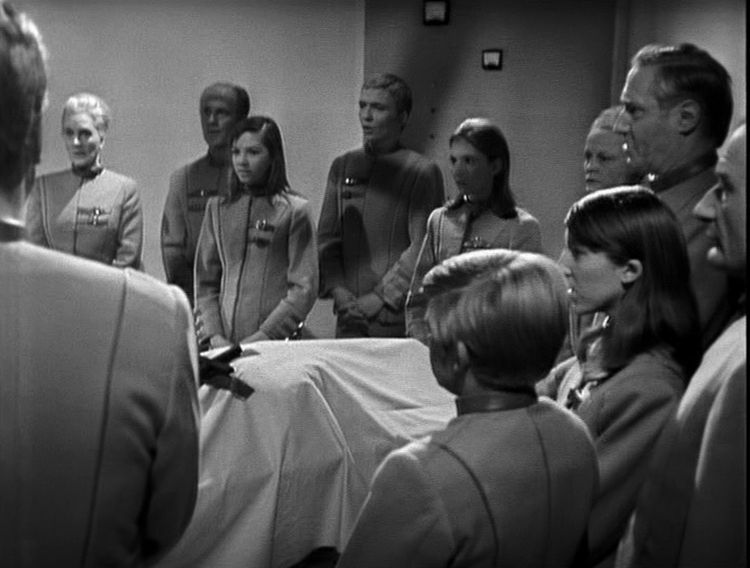 Back on Earth, there’s some quality actors (John Abineri, Noel Johnson, Robert James) who debate the future of the ship and the fate of the thirteen people onboard. The decision is out of their hands though – it rests with Abel who has taken control of the ship. The last few minutes are riveting and it’s certainly an ending that lives long in the memory. Possibly the strongest of the surviving episodes from the first series, Thirteen to Centaurus is a quality production adapted from a strong story which still packs a punch today. For anybody who wants an introduction to OOTU this is an ideal episode to start with.